Indian stock market emerging as top performer for CY14YTD, Major sector driving stock market is real estate, capital goods, metals, oil and gas, automobile and finance. We have seen Nifty and Sensex is touching new height every day. Almost all stocks are moving up except stock which is affected by negative dollar price movement. Healthcare and Technology stocks are underperformer this year. Positive election outcome has boosted the market. Strong government can lead to a more business friendly environment and revival in domestic demand. This will drive earnings upgrades for Corporate India over the next few years. L&T – L&T is leading the race with return on 45% in current year. It reminds me that we have recommended this stock in our earlier post. SBI – State Bank of India largest bank of India is on second number with 44% of return in current year. Axis Bank – Axis Bank is on third rank with return of 41% in current year. Sesa Sterlite – Sesa Sterlite is another top performer with return of 38% in current year. Last month (May-2014) this stock gave return of 51%. BHEL – In capital goods sector this is second stock which is on top performer list. BHEL gave return of 37% in current year. ONGC – Oil and Natural Gas stock gave return of 31% in current year. M&M – Mahindra & Mahindra our one of the recommended stock gives return of 30% in current year. ICICI Bank – Private sector bank stock is also booming. Stock of ICIC gives return of 29% in current year. Maruti – Maruti also become top performer by giving return of 29%. Apart from this stock like Coal India, Hindalco, HDFC bank, Reliance, NTPC gives very good return in 2014. Stock which fails in delivering return in 2014 are TCS, Cipla, Wipro, Infosys. 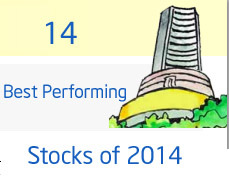 Do you think these 14 Best performing stocks of 2014 will continue to deliver good return in future also. Do share your views!